Recently we had the opportunity to spend a week at Kaanapali Beach on the west coast of Maui. Having visited a few times before, our "no-longer-tourists" itinerary looked much different this time. In summary: Eat local, drink local, and swim with the amazing sea life. We couldn't get enough of these three things each day. Below are the "best of" from our time in Maui. We HIGHLY RECOMMEND this stop!! Hands down our "diamond in the rough" find this trip. A modest seafood market hidden in a strip mall with the freshest daily catch for sale – raw from the deli counter, or prepared (sandwiches, tacos, plates, soups). We were on a mission for fresh poké and were blown away by the flavor and quality we found here. We took some containers of seafood goodness home to enjoy on our lanai with a cocktail of Maui made Ocean organic vodka, and pineapple juice. A beachside barbecue for authentic Hawaiian cuisine. They offer a number of "mixed plates" that include local favorites such as kalua pig, lomi salmon, coconut prawns, and shoyu chicken. Wash it all down with a famous frozen cocktail (the Lava Flow is our favorite!) or a local craft brew. We had a number of beer industry people recommend this place, so we knew it had to be worth the stop. Quaint roadside restaurant and counter-serve pie shop that's easy to pass by if you aren't on the lookout. We recommend Olowalu lime pie paired with Kona's Lemongrass Luau. Voted the "Best Burger in Maui" 10 years in a row, with lots of creative toppings. They feature a rotating selection of craft beers and tons of Hawaiian cocktails. We highly recommend the fish menu – they take the daily catch and offer 5 different options of preparations. The Ono tacos paired with a Maui Brewing Bikini Blonde Ale were amazing, and you can't beat that second floor view of Front Street and the ocean. Hawaii is slowing gaining presence in the craft beer industry, with 10 year veteran Maui Brewing leading the way. They recently expanded to a larger 28,000 sq. ft, 55 bbl production brewery, built from the ground up with a number of eco-friendly features. We had the opportunity to meet with Owner, Garett Marrero – stay tuned for an upcoming interview post. Expansive bar area with indoor and outdoor seating. 30 beers on draft, featuring the flagships, seasonals, limited releases and uber special beers like Imperial CoCoNut Porter. Highlights: Oktoberfest, Haleakala Sunryes, Doppleshot Dopplebock and Pueo Pale. Open 7 days, 11am-10pm. Tours 3x daily. Primo Beer, the scoop: "Hawaii's original beer" heritage cans were everywhere. Suckers for beer history, we were curious to find out what the story was. The short version: started by Honolulu Brewing in 1897, re-opened post-prohibition as Hawaii Brewing in the 1930's. Acquired by Schlitz in the 1960's, production was moved to CA. Acquired by Stroh in the 80's, production was discontinued until the rights were acquired by Pabst in 2007. Primo sold in HI is brewed in Kauai by Keoki Brewing Company. It's a pretty standard light lager. Nothing crazy spectacular, but delivers as thirst-quenching on a hot day. Front Street Lahaina is an easily accessible area along the coast with a concentrated shopping and dining area. Many resorts offer a free shuttle service. The best place (and best prices) for vacation-y trinkets, Kona coffee, Hawaiian sea salt, macadamia nuts, booze and any other vacation necessities you may have forgotten. They have locations scattered throughout the island. Gourmet cookies hand-made with local ingredients, baked daily and packaged beautifully to boot. The pineapple shaped shortbread cookies come in a variety of flavors, garnished with fruit and chocolate. Available per cookie or in gift boxes. Chocolate chip macadamia paired with a Maui Brewing CoCoNut Porter = perfection! Great place for all things boasting Maui pride – t-shirt, hats, cover ups, sunglasses. Hats, hats, hats... well-made and unique styles to suit everyone. SPF and cute cover ups are key for pale mainlanders! 100% pure Kona and Hawaiian coffee varieties by the pound, Hawaiian hand-rolled cigars and other gifts. Take a picture at Banyan Tree Park, the trees are epic!! Maui Adventure Cruises for snorkeling, dolphin and whale watches. We did an unbelievable 4.5 boat snorkel trip around the island of Lanai'i to two preserved tropical reefs. Snacks, drinks and equipment included. Snorkle Bob's, 1217 Front St.
Best spot for renting or buying snorkel gear and apparel. They also can set up boat cruises, helicopter tours and other Maui adventures. Snorkeling can be found beachside to most resorts or public beach areas, but the best snorkeling are preserved reef areas, accessible by boat tours. If you like snorkeling, the islands like Lanai and Molokini have some of the best – the tours are worth every penny. If you're driving East on route 30, there are some beautiful look out points north and south of Maalaea Bay. Stop and take it all in! If time allows, we highly recommend taking a day trip drive around the island. The breath taking views, waterfall hikes and hidden beaches are more beautiful than words could describe. If you're lucky, you may see a rainbow over Haleakala. Getting away from the resort areas and seeing the real Maui will give you a whole new appreciation for island life. Over the past year we've seen a pretty significant showing in the design and branding world of a technique described as mono-line or line craft. It is defined by a consistent pen stroke throughout the illustration or logo. 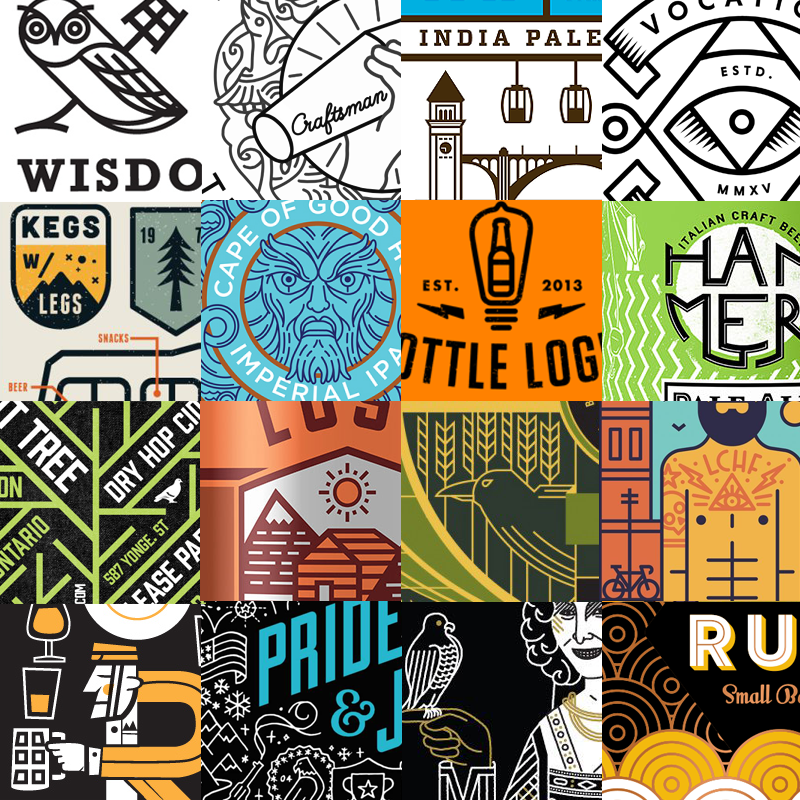 This style, which has been a popular way of illustrating infographics is making a strong appearance in craft beer, cider and kombucha graphics. This style has quite a bit of range in how it is executed, from very technical and pragmatic to hand-drawn and expressive. With an ability to communicate many things – and provide significant clarity and readability at shelf – we think line craft has some longevity in the category. Below is a collage of examples we found particularly interesting. Have thoughts, drop us a line!